by Judy and Chris Rouse. Judy and Chris Rouse gave a very interesting account of the very hard life the Railway Navvies had during the early 1800’s, building the network of railways in England. At its peak there were over 100,000 “Navvies” building the railway network and contrary to what we assume, only a small proportion were from Ireland, coming here for work during the potato famine. The navvy's tools were a pick, shovel and a wheelbarrow, all carried on his back between jobs. Needless to say they were very strong men who worked hard and and played hard and also drank large amounts of beer. Gangers sold beer to the workers, it was illegal at the time, but as it kept the workers happy, a blind eye was turned to it. 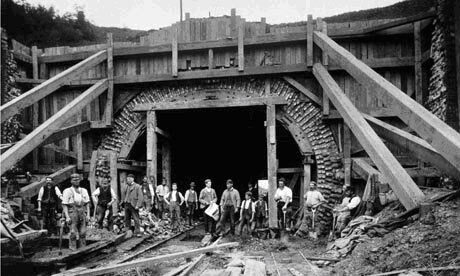 A lot of these navvies, previous to working on the railways, worked on the canal network around the country and they would roam the country with their wives and families looking for the next project to work on. In our modern world, it is hard to imagine how hard a life it was in those days, building the railways and canal networks that we take for granted today, when there were no mechanical diggers or cranes to move earth and all had to be done by hand with help from horse drawn trucks etc. All welcome Members free, guests £3.